This blog is about beauty and healthy tips especially for woman. This blog also contain health articles that is interested for me and maybe interested for you too. Some of the tip articles write in Indonesian languages but many of them in English. Enjoy it and get healthy. 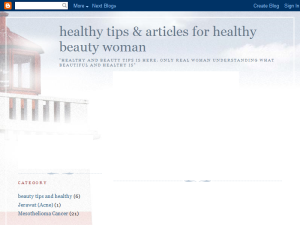 This what your Healthy tips and articles for healthy beauty woman Blog Ad will look like to visitors! Of course you will want to use keywords and ad targeting to get the most out of your ad campaign! So purchase an ad space today before there all gone! If you are the owner of Healthy tips and articles for healthy beauty woman, or someone who enjoys this blog why not upgrade it to a Featured Listing or Permanent Listing?